The Zinger Lite has been carefully designed and engineered to welcome you to the Crossroads RV family! The Aura Travel Trailer Series is the newest Ultralite line-up from Travel Lite RV. Zinger RV's are known for solid construction, dependable components and family pleasing floor plans. Your path to make memories! With Springdale we understand that your hard earned money should go as far as your adventure can take you. We deliver the best features and quality. When it comes to impeccable design in a lightweight recreational vehicle, no one does it quite like the Keystone Passport Ultra Lite! Choosing the right Cargo trailer just got a whole lot easier! Welcome to Under the Stars RV! We are a full service centre with propane licensed technicians. We work on everything from Hitch & Wiring, Plumbing, Propane, Hardware, Insurance jobs, and Warranty issues. 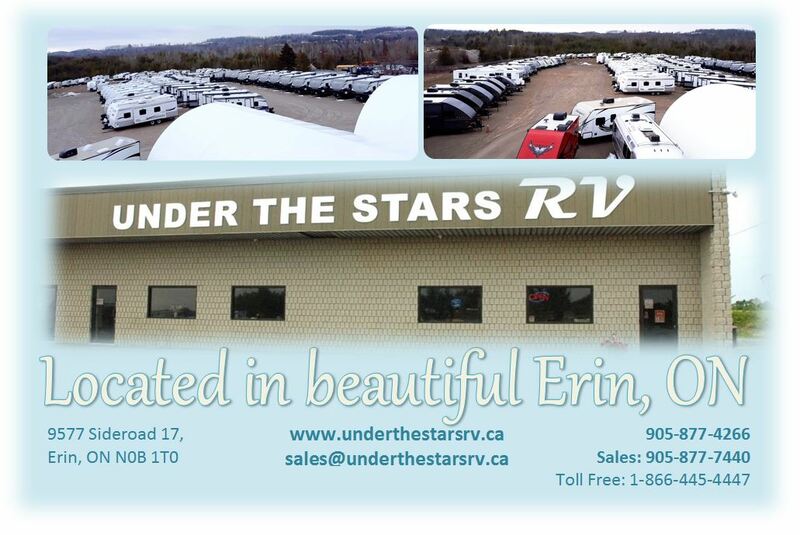 UNDER THE STARS RV pride ourselves on great, quality service with no hassles, fair pricing, courteous and Knowledgeable staff. We service all makes and models of Travel Trailers, Tent Trailers, Fifth Wheels, Truck Campers, and Motor Homes (except engines). Full Service Bays with licensed technicians provide everything from Hitch & Wiring to Plumbing, Propane, Hardware, Insurance Jobs, and Warranty Issues. Antennas, Fridges, Hitches, Wiring, Brake Controls, Air Conditioners, Water Heaters, Toilets, Electrical, Trailer Covers, Vents, Tires, Plumbing fittings etc. Great Parts...Great Service... Great People!